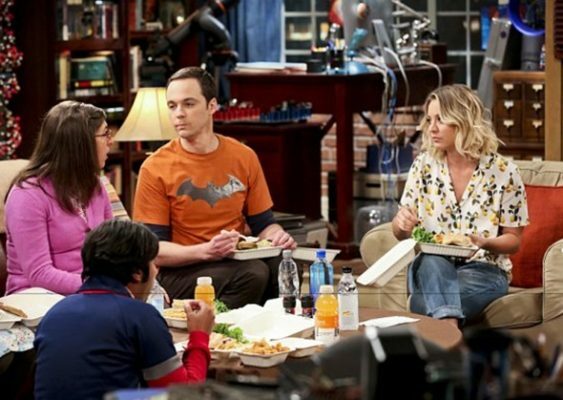 As reported earlier, CBS has renewed The Big Bang Theory for two more seasons. However, according to The Hollywood Reporter, the sitcom’s leading cast members took a pay cut during renewal negotiations. The Big Bang Theory is currently in its 10th season. The popular comedy stars Jim Parsons, Johnny Galecki, Kaley Cuoco, Kunal Nayyar, Simon Helberg, Melissa Rauch, and Mayim Bialik. According to THR, the five leading cast members (Parsons, Galecki, Cuoco, Nayyar, and Helberg) all took a $100,000 pay cut to support fellow co-stars Melissa Rauch and Mayim Bialik’s demand for salary parity. While the five leads are expected to make $900,000 per episode for seasons 11 and 12, Rauch and Bialik have been paid $175,000 per episode since their last contract negotiations three years ago. Though THR says the odds of Rauch and Bialik receiving salary parity are slim, The Big Bang Theory remains a hot property for CBS. So far, season 10 is averaging a 3.27 rating in the 18-49 demo and 14.528 million viewers, making it the network’s highest-rated series. Additionally, CBS has ordered a spin-off of the sitcom, Young Sheldon, that will focus on Jim Parson’s Big Bang Theory character as a kid growing up in Texas. What do you think? Do you watch Big Bang Theory? Do you think Rauch and Bialik deserve the same salary as the lead cast members? Yes I do. They are both excellent in their roles. Mayim Bialik has been nominated several times for Best Supporting Actress. She hasn’t won but considering the competition in that category, it’s an example of how good she is. And Melissa Rauch is hilarious. Give’ em both lots more money! I think that is they are on screen as much as the other leads (I don’t believe there are 5 lead characters anymore) than yes they should get the same money as the others! Besides my favorite character is Bialek and pretty much always has been!!! Frankly I’m surprised that they stayed with that huge a pay difference. Their agents weren’t serving them well. I think they should be brought up to $450,000 an episode which would bring them up to 50% of the leads salaries. A significant step up from the 18% they have been paid. I’m just happy when cast members are willing to take a cut for the integrity of a project & in support of their fellow thespians. The show could easily do without either of them especially the woman who plays Amy. She was funny at first but frankly her whole story line has mad Jims character much less funny. So frankly I wish they would get rid of her and bring in some fresh blood. A raise yes but not the same. They are good and important but not the leads. Absolutely!! They are as big main characters as everyone else and they bring so much to the show. I love this show and all of the characters. Give them the money! Well, maybe not 900,000 an episode, but they definitely deserve a big raise! Bernadette and Amy, have both become an important part of the story line.